You’ve read every book and trick under the sun about getting your baby to sleep. But when the time comes for you to slip into the land of nod yourself, a pat on the bum and a tissue swept across your face isn’t going to cut it (or is it?). 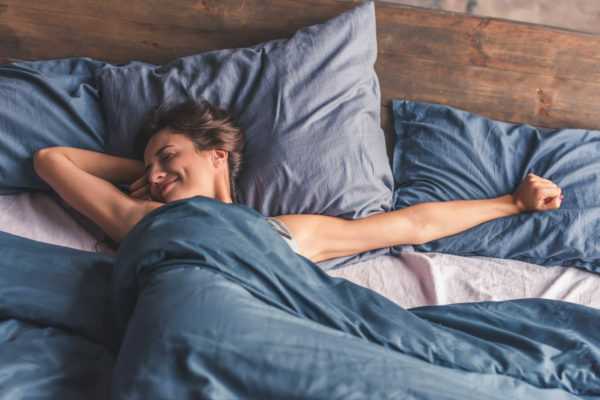 Yoga is already well known for its relaxing and restorative qualities, but did you know there’s one pose that’s particularly helpful for anyone who struggles to fall asleep? And you don’t need to be a Super Yogi to master it. The legs-up-the-wall pose, also known as viparita karani, is considered a gentle inversion that helps calm the body. Once your body is relaxed, your mind will follow suit. The benefits of yoga include increased flexibility and reduced stress. Additionally, a 2004 study revealed yoga as an effective method for treating people with insomnia. After eight weeks, the participants reported having higher quality and longer bouts of sleep than those who didn’t practice yoga. Committing to yoga for eight weeks isn’t for everyone. Luckily, skipping to the legs-up-the-wall pose (a pose usually practised at the end of a class) will still have the same relaxing effect. Speaking to the LA Times, Yoga Medicine founder, Tiffany Cruikshank, says legs up the wall is a great way to unwind before bed. This pose can be performed next to any wall. Simply sit down on the ground with your left or right side against the wall. Take some deep breathes, and slowly lower your shoulders to the ground, raising your legs into the air. Slowly swivel your hips until your bottom and legs are resting comfortably against the wall. If you feel a stretch in the back of the legs, you may need to move your bum further away from the wall. Place your arms out wide and your palms facing up. Most importantly, relax. Try and spend ten minutes in this position (or whatever is comfortable) before climbing into bed. Although it’s recommended you do this pose on the floor, nothing is stopping you from sliding your legs up the wall from the comfort of your own bed. Legs up the wall is a relatively safe pose. However, if you are pregnant or have any injuries, be sure to consult a doctor or health professional before making this part of your bedtime routine.